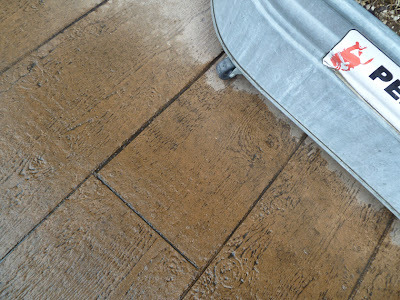 There were not so many posts last week, largely because I was traveling. 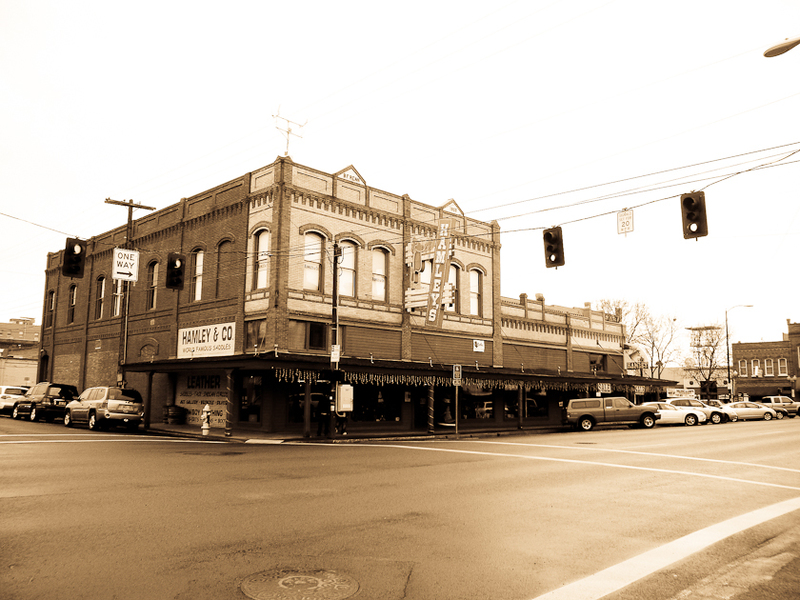 Work sent me to northeast Oregon again, this time to look at some great old turn-of-the century theater buildings. It was very dark and difficult to take pictures inside, the theater in one of the buildings was basically frozen in time, sealed off from the more modern users of the buildings (most recently a Domino's Pizza, of all things). 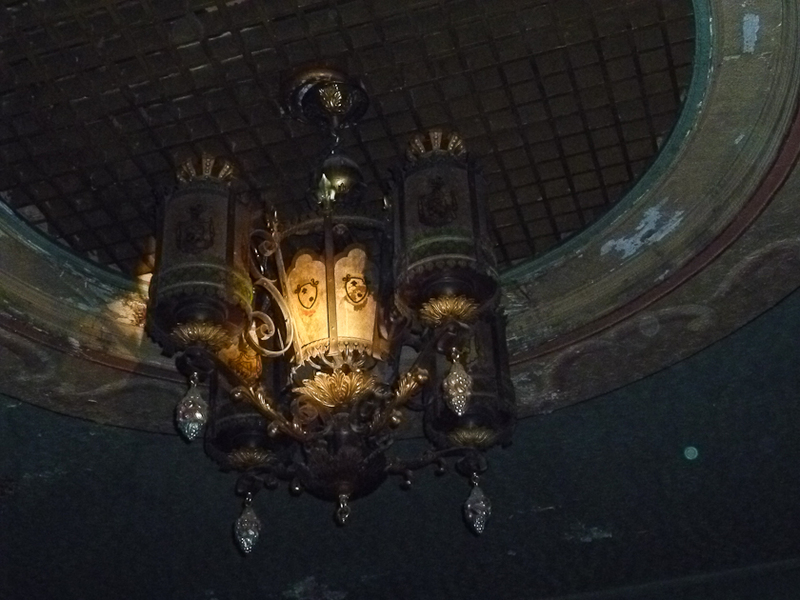 Even the old theater chandelier was still in place, dusty and in need of renovation, but very cool in spite of it. 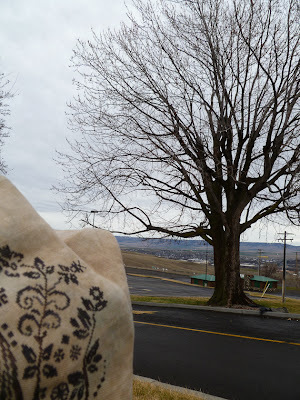 Anyway, my flights left from the airport in Pendleton, which gave me a little time to poke around downtown and go to the old woolen mill. Pendleton is an interesting little city with a lot of history, famous for it's rodeo and woolen blankets, and a lot of modern details to enhance the history. I noticed that the concrete of the sidewalks downtown was made to look like old wooden boards. Some of the buildings have been pretty well preserved. I mean, if it weren't for the stoplights and late-model cars, this old western wear store looks just like it could have in 1895. 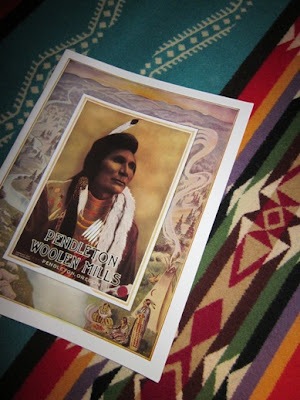 And of course I had to stop in at the Pendleton Woolen Mills factory. Pendleton Woolen Mills has an intersting history-- it became famous for "Indian Pattern" blankets in the early 1900s, using patterns created by a white artist with a love of native art. 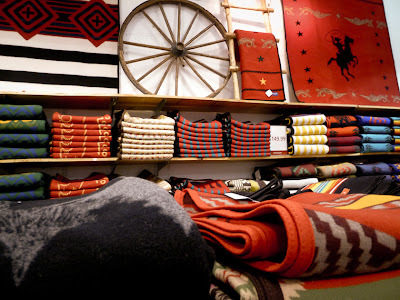 The blankets were adopted by many members of the nearby Nez Pierce tribe, and then through clever marketing, the company has been going strong ever since. 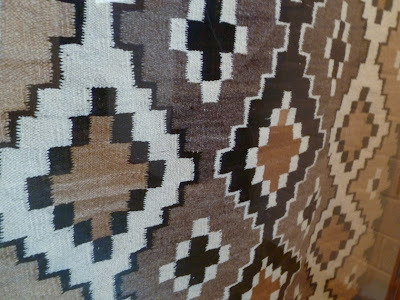 I have always loved the bold patterns on their blankets, and I have one hanging in our living room. 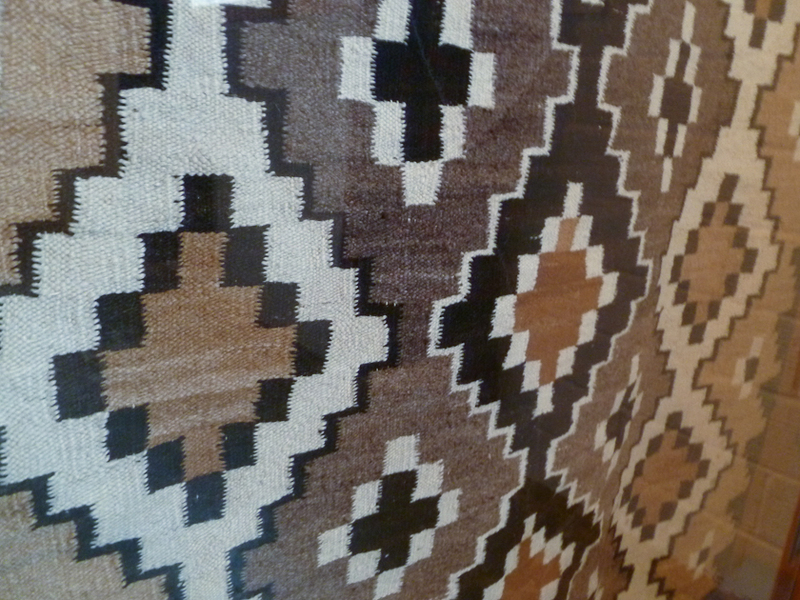 I managed not to buy anything this time except a key ring and a reprint of a 1915 catalog. Sadly, I didn't have time to take the factory tour, but a portion of the factory is visible through a window at the back of the store. 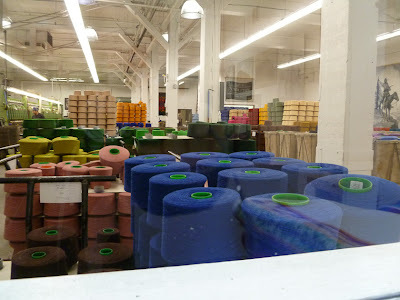 Look at all the giant spools of wool yarn! 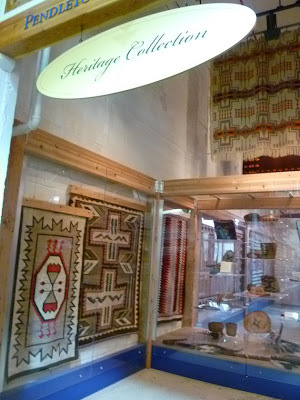 Again, sadly, they don't sell samples of the yarn. How cool would that be? Even so the factory store is pretty fun to browse through. 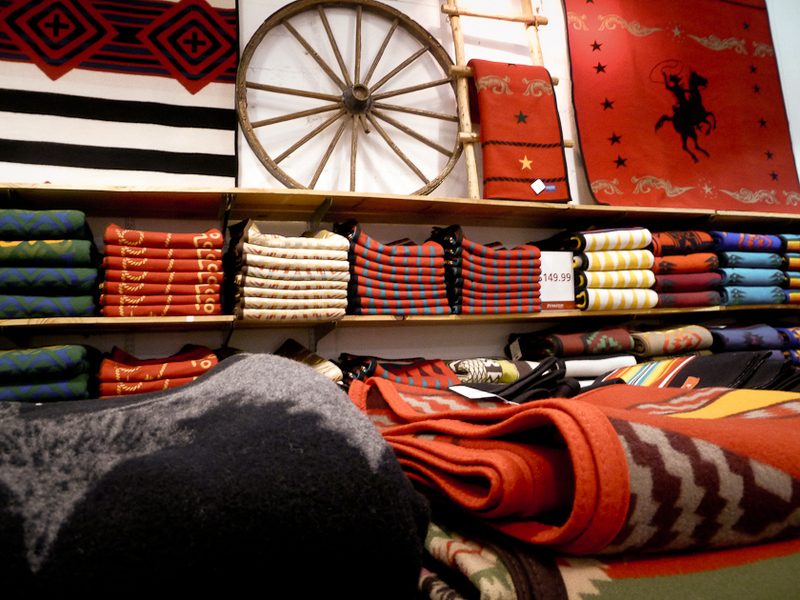 Hundreds of gorgeous blankets, and even a little museum of antique blankets and other native artifacts. 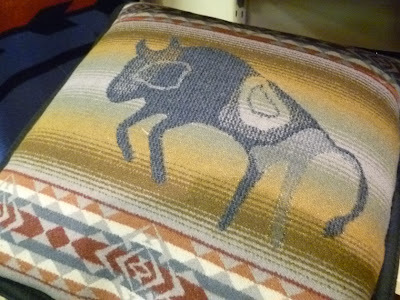 I *almost* left with this pillow. Maybe I should go back? But that would mean another set of flights in tiny 9-passenger airplaine...the last one had a very exciting landing during a windstorm back to Seattle. I will say though that the Pendleton Airport parking lot is the prettiest airport parking lot I have ever seen.